I hope you are all enjoying these last few weeks of summer! As Labor Day approaches, I know that many of you will be enjoying some fun in the sun. Let me just remind you to protect your skin! Don’t forget that your skin is your largest organ and you only get one chance to keep it looking and feeling healthy and functioning optimally. While it’s too early to start thinking about tweaking your skincare routine for the fall, I always encourage my clients to switch things up every now and then. The perfect way to experiment with different treatments is to play around with different peels. Peels are literally defined as removing the outer layer of skin. While that may sound drastic and scary, with the right recipe, there is no need to worry about ending up all red and splotchy the way you would after a professional chemical peel. 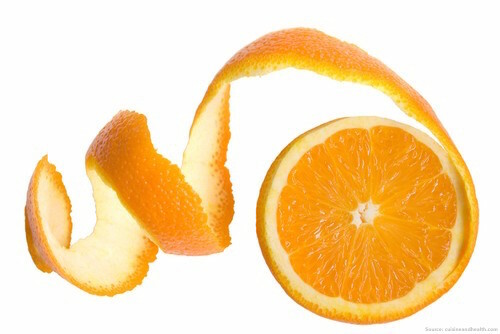 Natural peels that utilize fruit enzymes gently remove dead skin cells, which tend to cause a variety of issues. Peels can help skin woes from acne to dull skin, and everything in between. Here are my go-to peels that I personally use on a regular, rotating basis. Bitter Melon is a fruit widely used in Asian cuisine, and though it is not as popular in the U.S., it is grown in different countries all over the world. Bitter Melon was introduced into China in the 14th century and is widely used in Asian cuisine. It has also been utilized in Traditional Chinese Medicine to treat a variety of illnesses. The fruit, which somewhat resembles a cucumber, can also be used topically as an enzyme peel. 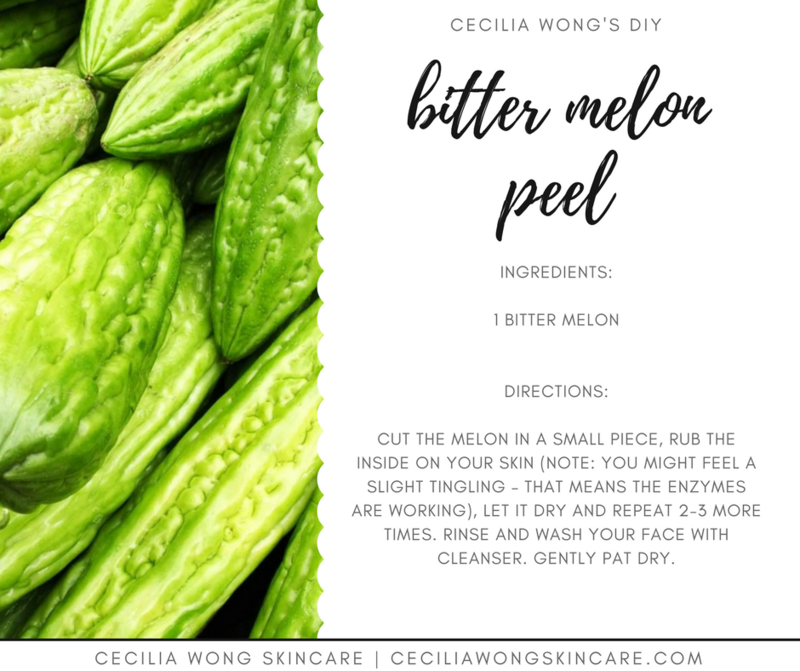 When I was just at the beginning of my skincare journey, Bitter Melon was my saving grace. The natural fruit enzymes located in the juice are powerful and help to cleanse your pores while healing breakouts. These enzymes also encourage cell turnover while gently exfoliating your skin. While Bitter Melon isn’t typically found at your local grocery store, Asian supermarkets tend to carry it, and it can also be found easily in Chinatown, NYC. I recently posted this recipe in my article on DIY facial treatments that double as snacks but I couldn’t resist adding it to this list due to its innate simplicity. While you may be more familiar with Papaya, you might not know that in addition to containing an abundance of Vitamin C, the tropical fruit contains potent enzymes. 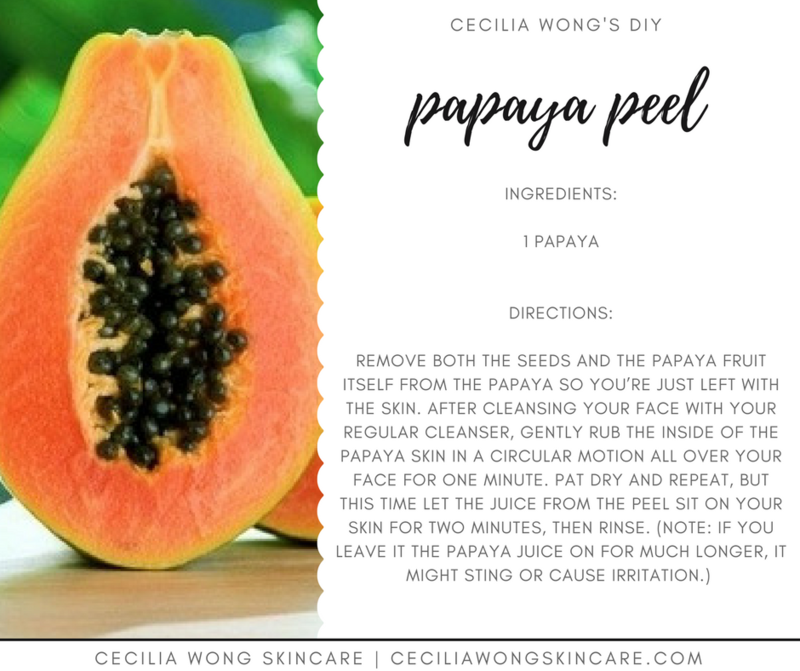 When used as a facial peel, you are able to harness the powerful natural enzymes found in the skin and juice of the papaya fruit. These enzymes help to chemically exfoliate your skin, encouraging cell turnover and getting rid of dead skin cells. Post-peel, your skin will look brighter and will be super soft and smooth. Though papayas are widely available at grocery stores, if you’re not into DIY recipes, instead, feel free to try one of my favorite face scrubs, Alchimie Forever’s Gentle Refining Scrub, which also contains papaya enzymes to achieve a similar effect. I formulated my Blemish Peel Mask to be used in three different ways: as a sleeping mask, a spot treatment or a 3-minute peel. 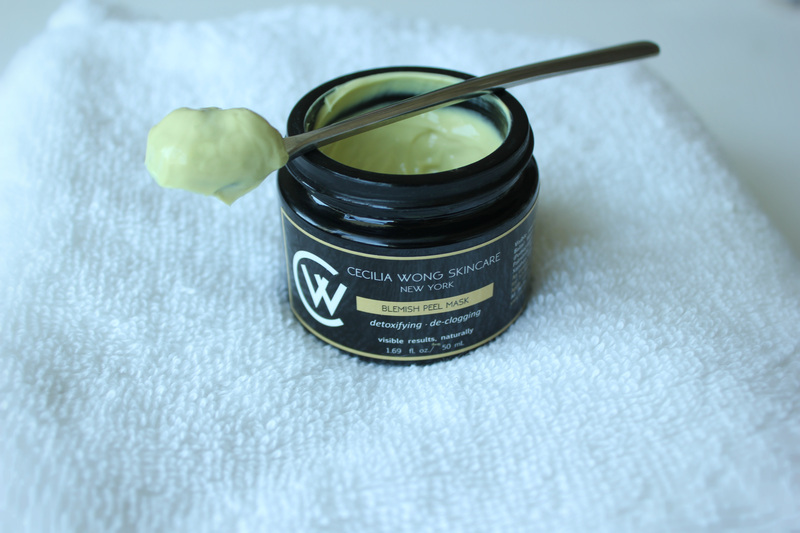 In this case, I recommend using it as a 3-minute peel by slathering the buttery formula all over your face and letting it sit for a few minutes. The stimulating herbs sage and spearmint help speed up skin’s microcirculatory system, helping to fade acne scars, oxygenate, unclog, and deep cleanse within skin’s dermal layers. After you wash it off, your skin will appear clear and pure with a softer and smoother texture, fewer breakouts and blemishes and accelerated healing of dark marks and scars. As many of you know, I’m a huge fan of DIY treatments, however for those of you who are looking for the maximum results from a peel, I’d go with my Blemish Peel Mask. Applying this peel 3-4 times a week will give you an express route to clear, glowing skin. Have you ever tried a peel on your skin? Did you notice a difference in your skin’s texture and appearance? Let me know if you try any of my suggestions and how they make your skin look extra glowy and bright! I would like to thank you so much for reading and so generously sharing! It’s always fabulous sharing these wonderful tips with you all!